There’s a distinct possibility that I’m becoming addicted to Whole Foods Market. Until this week I didn’t even realise they were in the UK, and have only seen them in American romcoms where everyone seems to either work there or as an architect. I’ve been working in Picadilly, though, which is home to (what I think is) the first UK store, and they’ve been expanding recently across London. It’s like my Mecca, my heaven, my Santa’s Workshop. This week I’ve raided the hot food deli bar (jambalaya – expensive but SO GOOD), the salad bar, and the pizza bar. 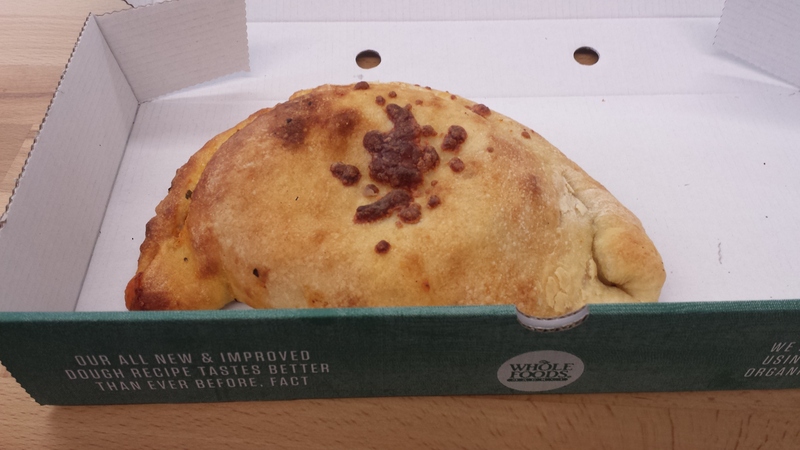 For just £5 you can have a calzone that’s the size of a large Cornish pasty, stuffed to the brim with delicious, organic ingredients. I went for the meaty option, which was chorizo, peppers, tomatoes and cheese (and probably a fair bit else). The veggie option also sounded amazing: mushroom, spinach and ricotta. I would have gone for it, but chorizo is my spirit animal. That makes sense, right? I wish I’d discovered Whole Foods before. My wallet doesn’t, but my stomach does. meh – as a former employee, i have some opinions on the company. but you certainly can’t argue with how amazing the food is. Agreed- they have some amazing food in there! I found the cheese counter last Friday. That’s this month’s wages gone! Ha, I just trekked back to Waitrose after indulging in Wholefoods cheese a few times. Mmm, Waitrose also has an amazing cheese selection… There’s a very good cheese shop near where I live in Reading, next door to an award winning butchers. I have to stop myself from going there, I could easily spend £100 on a trip!